3. Edits with 30% pattern opacity. 4. Edits with 10% pattern opacity. 5. Edits with 30% pattern opacity off white bag. Here are some initial comps to get every thing going. I haven't started working on the "tips" on the back. I first worked up the Inco mark. 1. I ended up making some tweaks to make it pleasing to the eye. One idea was to take some more inspiration from the building. I noticed the alternate brickwork on the front and thought it could make an interesting pattern. 2. Example of the brick pattern. 3. This was a reuse of a pattern from the last round to see if it could work with the new elements. I took elements from the current bag and the cold brew label and also utilized custom patterns and color to create the mock ups below. I really liked the "enjoy" script on the current bag, so you will see it throughout the mockups. Using the custom border from the cold brew label helps keep the brand cohesive. For now I left the bolt from the cold brew, I could see this sticking around as a support graphic that could be used in other projects, further tying the brand to the building, making it more robust. It can easily be removed or replaced with something else if just the Cottontown Cold Brew was to tethered to the historic building. I have left the on-site printed labels the same size and have not played with the layout or fonts since this is something you will constantly change, are these things you are wanting to play with? The patterns and colors help make the on-site printed variety labels more interesting and could easily start to creep into other branding projects. Also the copy on the back was something I copied from your site as a placeholder. 1. This version uses the same colors from the Cold Brew label, moves the instructions to side panel, and showcases "enjoy" on the opposite side panel. 2. 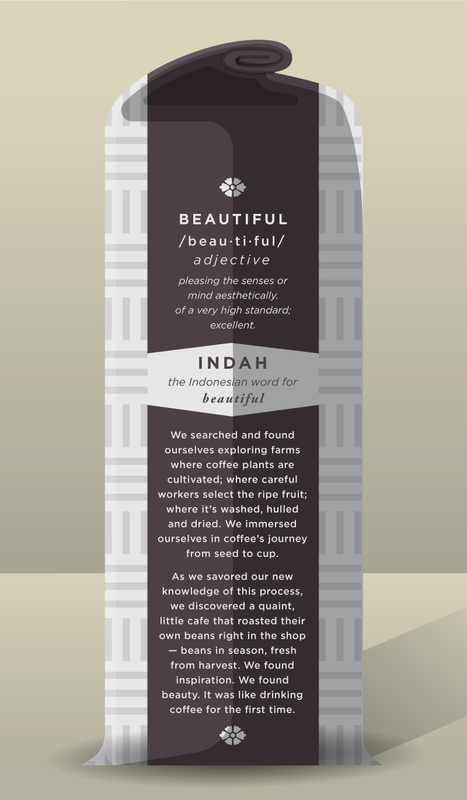 Same as above with the original format on the back and "Indah" branding on the sides. 3. Here we are introducing one of the patterns to the over all bag. Original back and "enjoys" on both side. 4. Same as above with "Indah" branding on the sides. 5. Introducing a new color and different pattern. 6. Same as above with the side instructions. 7. 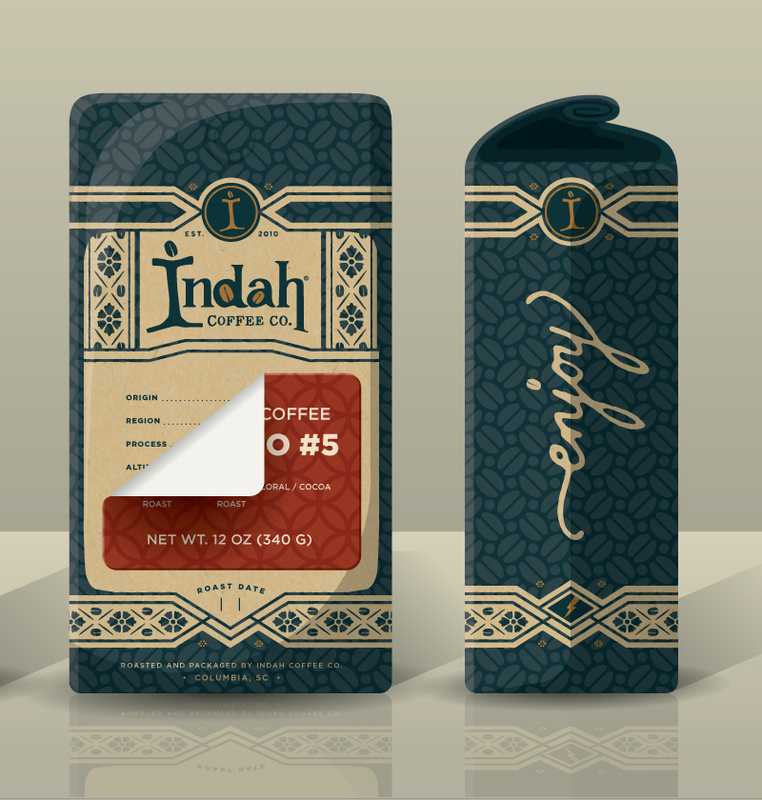 And with "Indah" branding on the sides.